Who doesn’t love it when an order arrives and you have new stuff to add to your inventory? But before you go too crazy unpacking your new products, let’s review the steps to properly receive this inventory. 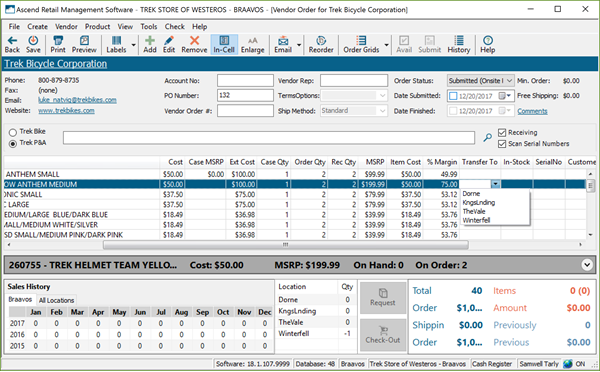 Select the Receive icon or View > Vendor Orders from the Ascend desktop to open the Orders window in Database Explorer. Double-click to open the order you are receiving. If the Vendor Order status is Submitted, Ascend will automatically place the order into receiving mode when you open it up. If the status is Unsubmitted, the order is pending and you can still add items to the order. You can see if the Order is in receiving mode by looking at the Receiving checkbox on the right. When this box is checked, items that are scanned in or entered in the search bar are marked as received. When this box is unchecked, they are added to the order. You can also check the Scan Serial Numbers box if you want to be prompted to scan the serial number immediately after receiving a serialized item. or right-clicking a column and using the Column Chooser to add or remove columns. If you’re receiving bulk items one at a time, select Product > Split All Items. This separates each item onto its own line to insure accuracy. And if your order has any, you can print Special Order receipts from here. Just select File > Print Special Order Receipts. Make sure the In Cell editing icon is active. 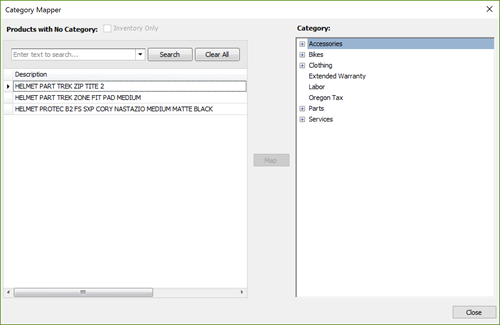 Multi-store retailers can quickly mark items for transfer without leaving the receiving window by using the Transfer To column. Select the dropdown arrow in the Transfer To column for your item. Next, choose the location the item should be sent to. If you accidently select the wrong one or need to clear this field, just select the field and hit Backspace or Delete on your keyboard. Highlight an item to see “at-a-glance” information including multi-store information, any pending transfers, and more. Don’t need to see all this info? Just select the arrow here to collapse the item detail bar. Once you’ve received everything for your session, select Save. If any of the products you received haven’t been categorized yet, you’ll be taken to the Category Mapper. You can select uncategorized products from here and quickly map them to the category they should be a part of by highlighting the desired category, and clicking Map. Once you’re done, the Category Mapper closes and the Receiving History window opens. This shows you the details of the order, including items received and the initials of the employee who received them. You should enter your Packing Slip and Invoice information here. Then select Okay. Then, if you have any special order items, you may be prompted to contact the customer the items are for. Lastly, you’ll receive a shipping prompt. 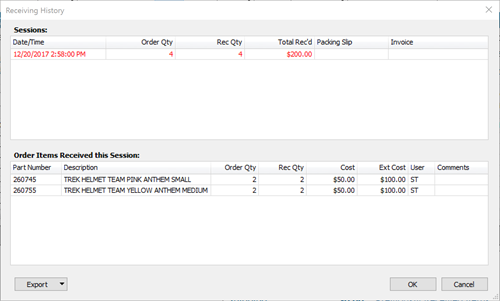 You can add the cost of shipping for this order, and even divide it among the items, if you’d like. If needed, check the Update Vendor Cost box to change the Cost in all the Vendor Products to what they were in this order. After all items are received and the order is saved, the Order Status will change to “Received” and the order will no longer appear on the list of Active Orders. 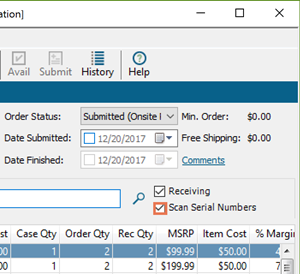 If you marked any items for transfer, those products now appear in your Multi-store > Check-Out Transfers screen and are ready for the next step in the transfer process.